As we look to the future growth of our community, we rely on positioning Boone and the High Country community in a positive and proactive manner to a variety of audiences. These groups can include visitors, relocating employees, or even businesses that are looking for a home for their headquarters or satellite operations. Our community has a compelling story to share about our high quality of life, excellent educational resources, emerging talent pipelines and growing medical infrastructure that are all complemented by our diverse marketplace. 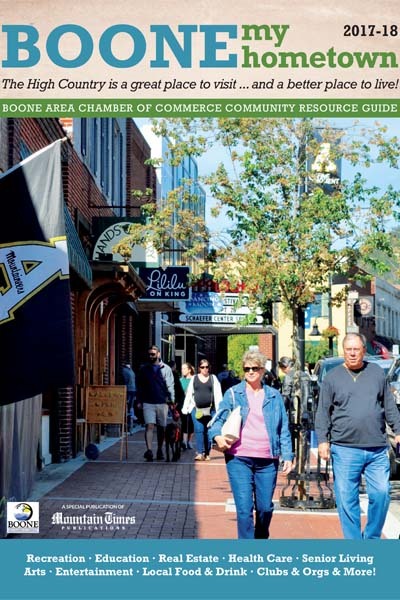 The Boone Area Chamber of Commerce and Mountain Times Publications will again partner to create Boone: My Hometown for 2019. Over 5,000 copies of this publication are distributed through area visitors centers, brochure racks, and news stands across the region. This publication is an essential piece of our visitor and relocation materials and helps explain the lifestyle and opportunities our community offers to all who seek information about our area. If you are interested in more information on ways to feature your business in BOONE: My Hometown, please contact Charlie Price at Mountain Times Publishing at 828-264-3612.